The big question arises: Upgrade or Replace My Server? One day, sooner or later, it will become obsolete, or your server is running, slowly, or running without disk capacity, or can not meet the requirement to install a new software, or your hear noises from blowers, or maybe the hard drive, or simply server crashed o fail definitively. We can upgrade the hardware of your server or upgrade to new operative system if your hardware support the new OS. The best solution we can recommend is the server upgrade, before replacement, becouse you can use the old server in other role with lower reliability requirements, or for testing new softwares, and in case the migration to new OS or definitively replacement the migration could be make more secure and less risky. Don't worry, ElectronicsJR can help you to find a cost effective solution for your server upgrade, migration and/or replacement, following your indications and budget. Sometimes your server only need more memory, more hard disk capacity, or other processor if it is supported in the motherboard. In other cases you need to add more hard drives so that they act like one big fast drive or set them up to be mirrored so that one drive in the system is used to automatically and instantaneously duplicate your data for real-time backup. Speed Server and performance increasing the amount of RAM, as much as your serverr can support. It improves productivity, handling more things at the same time without bogging down. Software and Operative System upgrades may require a memory boost. If your server is running slow, adding more RAM can be the least expensive way to get greater speed and boost server performance. The speed at which the Server process client request and data transfers is directly related to hard disk speed. The hard disk's performance is also critical tipycal multitasking tasks are being used or when processing large amounts of data. RAID 1 stores duplicate sets of data on separate drives. This configuration ensures complete redundancy of data. 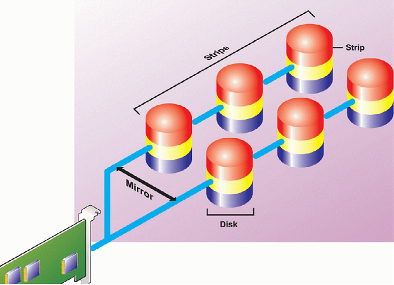 If a disk fails, the mirrored drive takes over and functions as the primary drive. 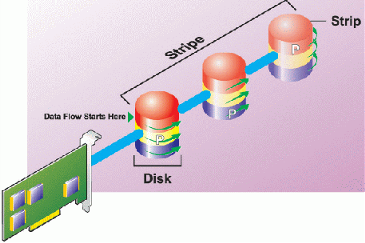 RAID 5 maps the data across the drives and stores parity information for each data stripe on different drives in the array. The parity data, labeled P in Figure is distributed. This lessens the data congestion that occurs if all of the parity data is written to one drive. A RAID 5 array can preserve data if one drive fails. 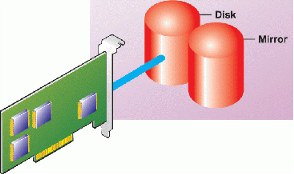 However, if two drives fail, all data in the array is lost.